JS: What was happening politically at that time? TJ: Certain people were being targeted because of their political affiliation. This particular house, the owner was a business man who had property in Clermont, he was targeted because of his affiliation to a political party. This is one of the houses that was destroyed completely. Because of that I got attracted to this house. It says something about the politics of Clermont, people were also punished through jealousies. Somehow as I decided to work on this particular project this container also came up. It sort of continued what I was doing with these paintings. JS: But you paint people from Clermont too. JT: I have a painting here that is titled ‘Whoonga Boy (The Black Painting Series)’ – it’s all about that, the ills in our society. It is pretty tough there, especially for the youth. A lot of them just cannot find jobs. There is so much of this drug addiction in Clermont. Whoonga Boy from The Black Painting series, 2012. 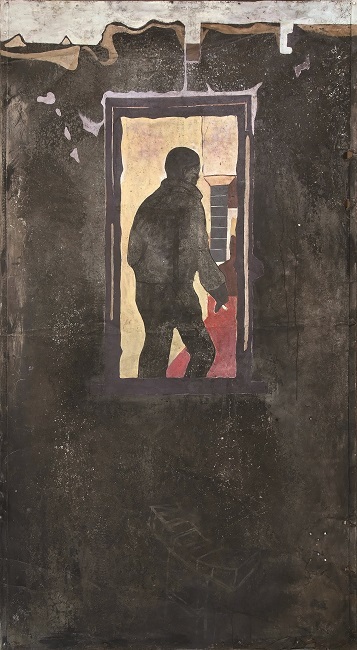 Acrylic on metal, 220.5 x 123.5 cm.The painting shows a view through a window. Inside, the young man, joint in hand is just a silhouette although the inside of the room has colour and depth – anonymous and malevolent, there are no features to humanise him. There is a whole generation using which is very scary. I couldn’t see this until 2007, and then it started making an impact on me. Now that I am a property owner there, my status has changed completely. I have to protect my asset and see to it that my neighbour’s property is also safe. It is such a problem this drug addiction. My feeling is that maybe we focus too much on those who are already addicted, we should start thinking about the ones not yet addicted and see how we can help them avoid this. It is such a serious thing. One of the metal dogs got stolen from my yard, and I know that it is these Whoonga boys, they pick up any metal they can find to sell for scrap. We have even started using plastic taps, because you can’t have a metal tap in our yard. That is why I have this painting ‘Whoonga Boy’, because it is indicative of the society we live in and a generation we are losing. JS: It is ironic as well as this is the “Born Free” generation – born during the democratic era. TJ: It makes you wonder what will be happening 30 years down the line. The problem is now with these drugs, is that they don’t have to be imported. They are making them. This Whoonga started right here in Marianhill and now it is all over the country. I think one of the problems with drug addiction it doesn’t give you a chance. One blow and you are addicted, it is very terrible. JS: The themes that you have been presenting; you have always been very interested in structures. When one looks at your work it’s largely presented through the building as a metaphor. Talk to me about these themes. Glimpse of the Inside I, 2011. 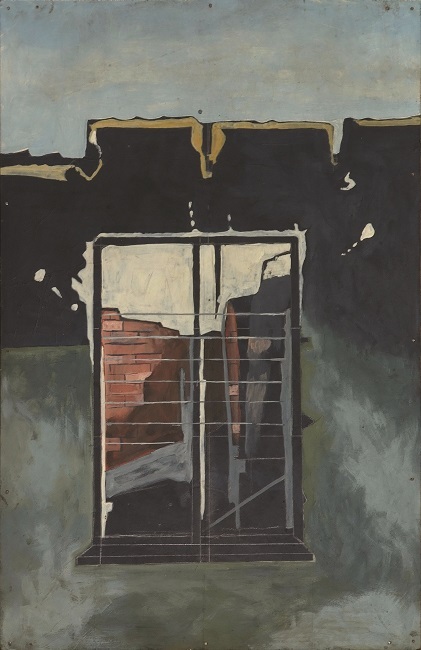 Acrylic on board, 59.8 x 38.8 cmJali consistently uses buildings as a platform to explain aspects of a crumbling society. Like a movie set that disappoints with its two dimensional facade ‘Glimpse of the inside I’ 2011 plays with the notion of depth as a metaphor for the shallow and transient quality of township existence. JT: I continued to draw houses right through my life. It is because it is being able to create space on a flat surface. That is mainly why I like to paint houses. I know that at some point in time, especially at the height of the struggle, I actually started doing abstract work, which meant that people were disappearing more from my works. I know that at that particular stage, In 1986 I had a very harsh experience in at my own house in Clermont – it was also burnt down. I had a bad experience with people; black on black violence. At that point in time I took a conscious decision not to include people in my work, because I didn’t want to immortalize people who were busy destroying things. I understand there was a revolution, but in that revolution there were elements that were destroying other peoples properties out of pure jealousy. At that time you were not allowed to have a nice looking house in the township. It was wrong to buy a car. The question would be where do you get the money to buy a car? The answer would be so quick to come – you are colluding with the enemy, you are colluding with the white people. How can you develop when other people are not developing? It was very tough. That is why people’s houses were getting burnt down. We may say that that particular house I ended up focusing on, just painting sections of it. You may say, yes, the occupant was belonged to an unpopular political party, but he was also a very successful businessman in one of the rural homesteads – he had big businesses there. So he was punished for being rich and successful. Life was very tough in the township then. Even government buildings – they had to go. People felt that they did not own these structures. You would not go and build a community hall in the township in 1985. It would have been reduced to ashes within a week. They would wait for you to finish it and destroy it. That was a political statement. It made life uncomfortable for a lot of people. Not because the people did not want to join the revolution. That was the time when people had no choice. You just had to join the struggle. The problem is the criminal element that keeps creeping in when these things are happening. Whoever was leading the struggle, would completely ignore what was happening to other people. TJ: You could be punished for nothing. You would be taken to the corner of the street. At the corner of the street where I stayed there was a kangaroo court. Every Tuesday evening someone would be getting punished there. I remember at that point in time I was busy with my gumboot dance group. We would rehearse at home every evening with these boys. We were once approached. Some people were sent from the kangaroo court to come to confront me to say “look we are busy fighting for you but you don’t attend these meetings” I felt I didn’t have to because I knew what was happening there, and I know that I wasn’t selling out. So I told them “continue with your kangaroo court I am giving these young boys skills here. I don’t need to go there when I am doing something very positive here”. I excused myself completely from that and they stopped coming. I was making my contribution, I was producing political work. I was very much involved as a cultural activist but I didn’t want to go around sjamboking people. I just can’t do it. Those are the things that are coming up in my work every now and then to say my concern is the township, because I live in the township. It is what is happening in the township. I am not even talking about houses. I am talking about the morals in the township. JS: What is happening right now in Clermont and other townships? TJ: Clermont is turning out to be a Mecca of entertainment in KZN – in the taverns, in the shizanyama’s. I was watching a video about a week ago. A young man shows me this video of a young girl who was dancing in front of this tavern not far from my house, and it was a striptease thing. And what they do is make a video of this thing and start sending it all over. These things are a very big concern. These things I feel as artists we should be trying to address. I don’t know what the young artists feel about this; maybe it is just my age, which makes me feel that these things should not be happening. Life is not changing in the townships, it is actually becoming worse. Even the new dispensation doesn’t seem to be helping, just in terms of moral integrity. It is something that we as black people inherited from the past. JS: How would you explain it? TJ: It isn’t anybody’s fault. Black on black violence cannot be blamed on anybody, except black people who are involved in this. It doesn’t matter who created it; who influenced this side or that side. The reality is that it is still there. This jealously that developed then – you still see it in the township. It became a culture. People in the township still don’t want to see other people advance. It is still very difficult to do that. Although I do not present people in my work, I feel that as a metaphor, old buildings and buildings that have been gutted down by fire, they represent the struggles in the township. Especially you will notice with the green ones, there is a lot of shrapnel on the floor, the buildings are broken down. This picture is all destroyed and chaotic. It is not about moments of happiness or moments of joy. Not that I don’t want to express joy in my life, but it is also important to look at what is happening behind the scenes. Where are we going? If you think about what Ernest Mancoba said about progress. Asking a simple question about what are we leaving behind as we progress. What do we leave behind in the name of progress? Whatever we leave behind unfortunately is our present. It is what we witness. If you witness negative stuff – that is what you leave behind. Without being a politician or a councillor we can all contribute in our society to try and change this. That is why I work with very young people. If we can instil creativity in those young minds right now, that creativity will stand them in good stead as they grow. They would have an understanding of what creativity is and that creativity can actually be developed. You might be born with talent, but creativity can be developed. It is something you can learn. I really believe it because I have seen it. I think that it is good for young people. Even if it is only to play one instrument, it is important.